These abscesses are uncommon, but may be single or multiple. The commonest cause used to be a portal pyaemia from intra-abdominal sepsis, e.g. appendicitis or perforations, but now in many cases the aetiology is not known. Biliary sepsis, particularly in the elderly, is a common cause. Other causes include trauma, bacteraemia and direct extension from, for example, a perinephric abscess. The commonest organism found is E. coli. Other organisms include Streptococcus faecalis, Proteus vulgaris and Staphylococcus aureus. Streptococcus milleri and anaerobic organisms such as Bacteroides are now more frequently seen. Often the infection is mixed. Failure to culture an organism may be due to previous antibiotic therapy or inadequate anaerobic culture. Some patients are not acutely ill and present with malaise lasting several days or even months. Others can present with fever, rigors, anorexia, vomiting, weight loss and abdominal pain. In these patients a Gram-negative septicaemia with shock can occur. On examination there may be little to find. Alternatively, the patient may be toxic, febrile and jaundiced. In such patients, the liver is tender and enlarged and there may be signs of a pleural effusion or a pleural rub in the right lower chest . Patients are often investigated as a ‘pyrexia of unknown origin’ (PUO) and in the mild chronic case most investigations will be normal. Often the only clue to the diagnosis is a raised serum alkaline phosphatase. The serum bilirubin is raised in 25%. There is a normochromic normocytic anaemia, usually accompanied by a polymorphonuclear leucocytosis. The serum AP and ESR are often raised. The serum BI2 is very high, as vitamin Bl2 is stored in and subsequently released from the liver. Blood cultures are positive in only 30% of cases. 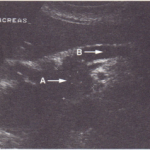 Ultrasound is useful for detecting fluid-filled lesions. A CT scan is of value for further localization. A chest Xray will show elevation of the right hemidiaphragm with a pleural effusion in the severe cases. Aspiration of the abscess should be attempted under ultrasound control. Antibiotics should initially cover Gram-positive, Gram-negative and anaerobic organisms until the causative organism is identified. Further drainage via a large-bore needle under ultrasound control or surgicaUy should almost always be performed if a localized abscess is found. The underlying cause must also be treated. The overall mortality depends on the nature of the underlying pathology and has been reduced to approximately 16% with needle aspiration and antibiotics. A unilocular abscess in the right lobe has a better prognosis. Scattered multiple abscesses have a very high mortality, with only one in five patients surviving. Amoebic abscess This condition occurs worldwide and must be considered in patients travelling from endemic areas. Entamoeba histolytica can be carried from the bowel to the liver in the portal venous system. Portal inflammation results, with the development of multiple microabscesses and eventually single or multiple large abscesses. Clinically the onset is usually gradual but may be sudden. There is fever, anorexia, weight loss and malaise. There is often no history of dysentery. On examination the patient looks ill and has tender hepatomegaly and signs of an effusion or consolidation in the base of the right side of the chest. Jaundice is unusual. SEROLOGICAL TESTS FOR AMOEBA, e.g. haemagglutination inhibition, amoebic complement-fixation test, ELISA. These are always positive, particularly if there are bowel symptoms, and remain positive after a clinical cure and therefore do not indicate current disease. A repeat negative test, however, is good evidence against an amoebic abscess. DIAGNOSTIC ASPIRATION OF FLUID looking like anchovy sauce. Metronidazole 800 mg three times daily is given for 10 days. Some physicians recommend repeated aspirations in addition. Surgical drainage is used in patients failing to respond, in multiple and large abscesses, and in those with abscesses in the left lobe of the liver. Complications include rupture, secondary infection and septicaemia.